Our Trip to Hogwarts Pt. 3 – Wingardium Leviosa! There are a lot of souvenirs to buy in the Wizarding World and I mean A LOT. There are robes and scarves, stuffed animals, mugs and glassware, the entire book series in different formats and don’t even get me started on the candy. But none are quite so enticing and tempting as the chance to buy your very own wand. I knew the second we got off the plane in Orlando that this item would be on my shopping list. 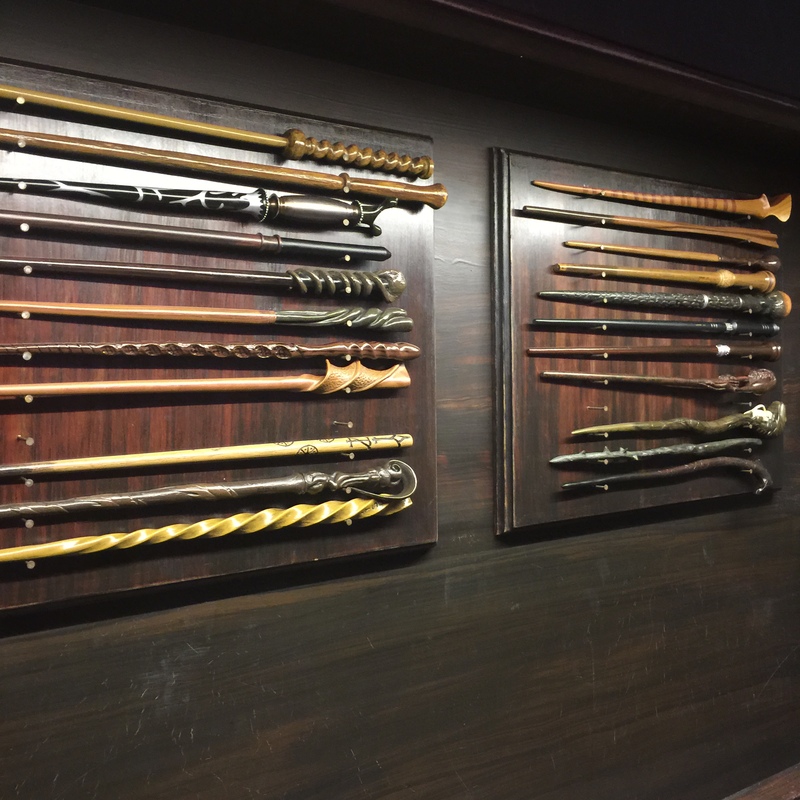 In many ways, the wands feel as essential to the park as Butterbeer or going into Hogwarts Castle, but in reality, the wands themselves aren’t much more than plastic sticks. So why do they fascinate us so much? 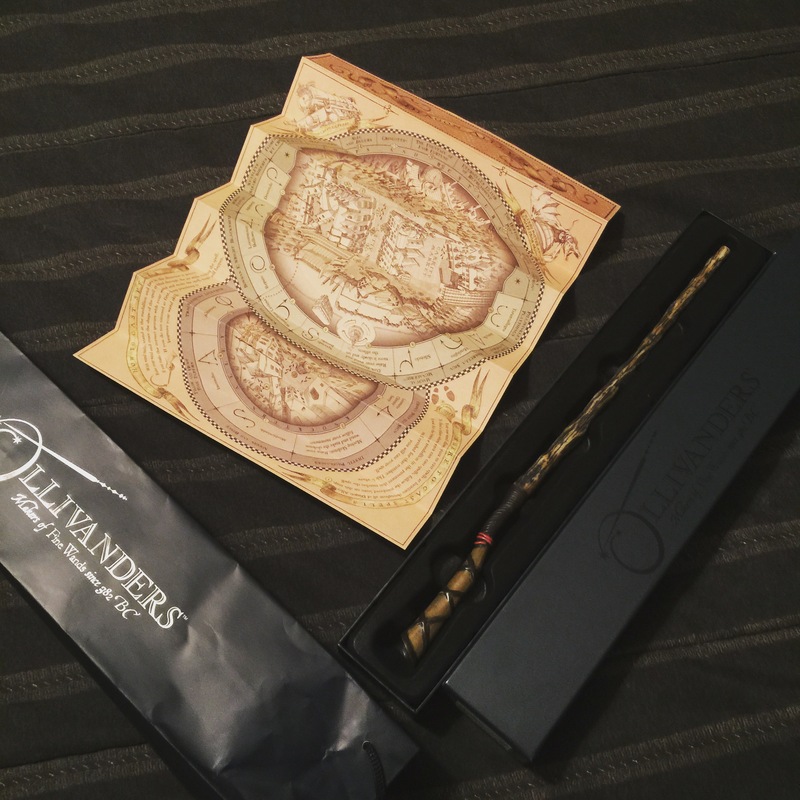 What makes us need to have our very own wand and what makes these wands so special? Let’s take a look, shall we? Remember that there are two sides of the park, Universal Orlando houses Diagon Alley, while Islands of Adventure is home to Hogsmeade Village. In Hogsmeade, you can actually watch a demonstration in which you see just how a wand chooses its owner and one lucky visitor per 25 who get to watch will get to be part of the demonstration. This is not done in Diagon Alley, thus the wait time to get into the shop at Diagon is much MUCH shorter. What really gets you started on wanting a wand though is simply walking into one of these shops. The shops look as though they have been taken straight from the film universe. Wand boxes layer the walls all the way to the ceiling and everything looks so enticing. The boxes feel so sturdy and everything has a great presentation about it. Even the people working the shop talk about the wands in a way that makes you want them. Yes, I’ll take all of them please. 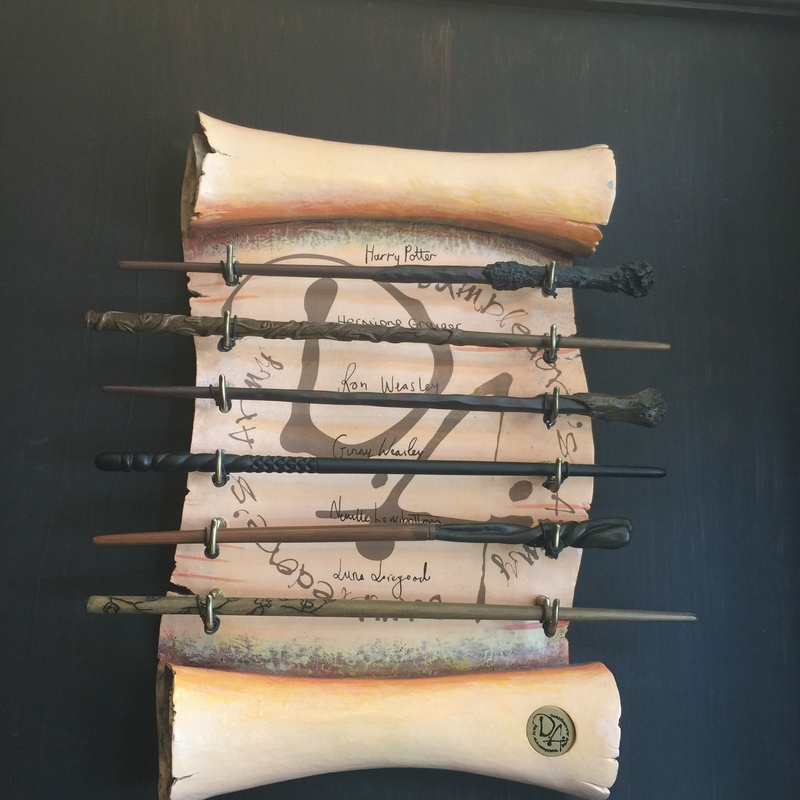 Famous Wands are those from the films, and are labeled with the character’s name who it belonged to, where as Olivander originals are made of different types of wood (Actually differently colored plastic) and were made for the soul purpose of the store, meaning that they don’t have a film owner counterpart. To make things more interesting, the wands range in two different types. Some are normal, meaning that you are simply just buying them for the aesthetic, while others, more expensive of course, are interactive. This gives way to the most special thing about the wands. 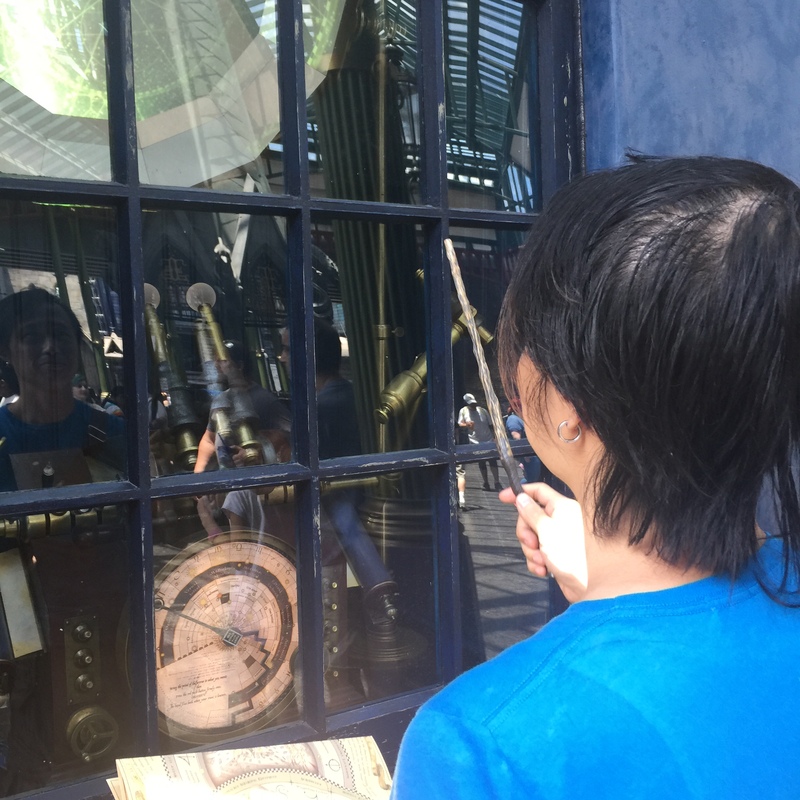 An interactive wand comes with a map and you can use that map to find places in the park where, by pointing your wand, equipped with a little sensor, at a certain object and doing a motion while saying the correct spell, you can actually make magic occur. The displays are so enticing. For example, you might go to the drinking fountain where you see a mark on your map. You stand on a little golden plate on the ground and then point your wand and say the specified spell, while doing the correct motion. If done right, the fountain will spray water at you from above. Other areas had fun things like seeing images come to life or statues start to move. The important thing to know is that it is just so immersive. We often ran into adults who were having as much fun doing these spells as the kids. There are plenty of styles to choose from. Upon entering the shop, we found that it was packed so we went to work trying to decide on a wand. While I found that many of them looked great, which is helped by the fact that they are displayed around the shop spectacularly, I wanted to get an original. For some reason, it just felt more special. We searched the various wands and I decided on Birchwood. For those of you who read my first novel, A Love Story for Witches, you’ll know that the female lead’s staff is made out of birch so this had a little something extra special for me. Each of these originals has a different wood and corresponds to a different month on the Celtic Calendar. Birch coincided with December 24 – January 20, but the whole year is here so if you want to get one around your birthday, this is also an option. Disclaimer though, don’t forget that ALL the wands are actually made out of mythical plastic. 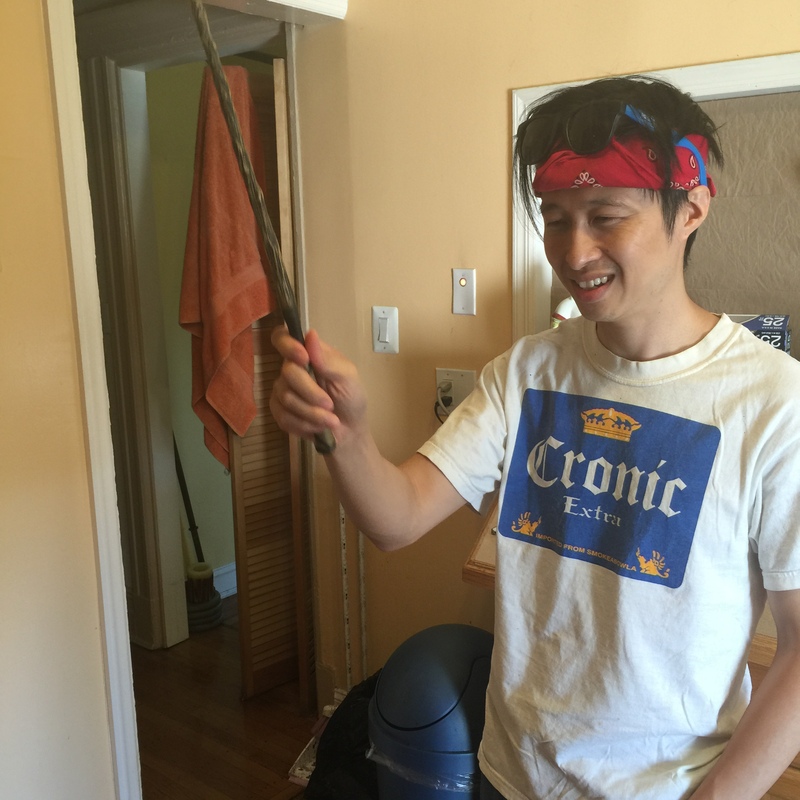 The wand that chose me. We made sure to get one that could do the interactive stuff so that we could try it out. 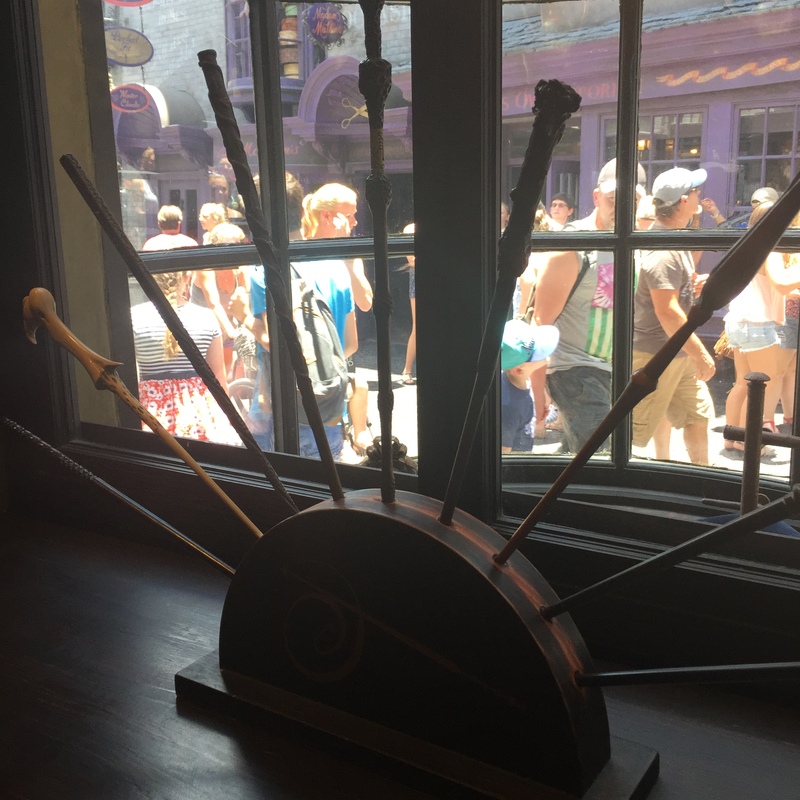 If you are planning to visit the park and want to get a wand, just know that the interactive wands are $45 while the normal replica wands are $37. Either way, be prepared to shell out a pretty penny if you are going to be getting more than one. 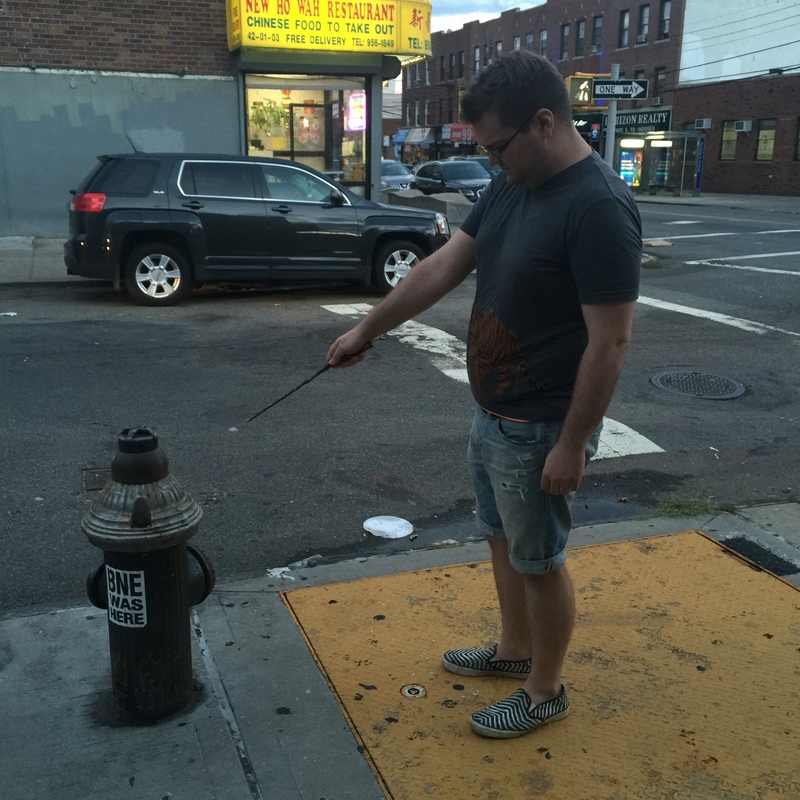 We went out on the street and quickly tried to start doing some magic. I will say, this part was a little less exciting than we had hoped. The couple we tried to do were a bit tricky and you had to be pretty precise to make magic happen. We also found that several spots in the park simply didn’t work. We were told by a worker, somewhat in secret as he didn’t want to ruin the magic for the kids, that with too much sunlight, some of them simply didn’t function. Good thing, the park isn’t located in a super sunny always summer place. Oh…wait. Carl attempts to make sparks fly. I also want to make a quick note that while many rides park-wide require you to stow any belongings in lockers, just know that the lockers will fit your wand so you don’t need to worry about what you’ll do with it if you want to ride a roller coaster. Yay! All in all though, I consider this to be a pretty worthwhile souvenir. The packaging and map look great and even the bag it gets put in is lovely. It’s fun to show off but sadly, does not work on normal everyday things. Trust me, we tried. And then we tried again. 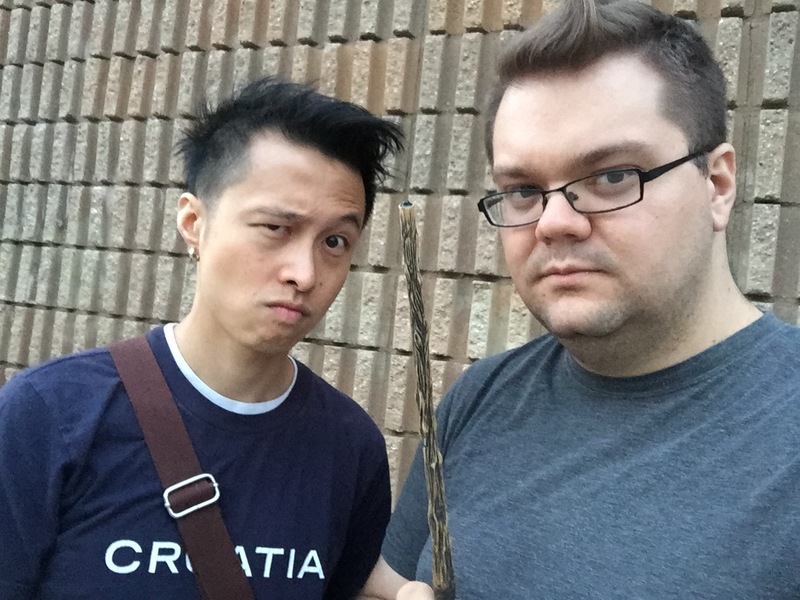 So we gave up and took a cool wizarding selfie instead. Mission accomplished…sort of. Time to manage this mischief. So what is the thing you have to have if you go to Wizarding World? What will you bring back or die trying? Let me know in the comments below! Next week, we’ll finish up this little tale with a look at the amazing rides and coasters of Wizarding World so make sure to check back for more! 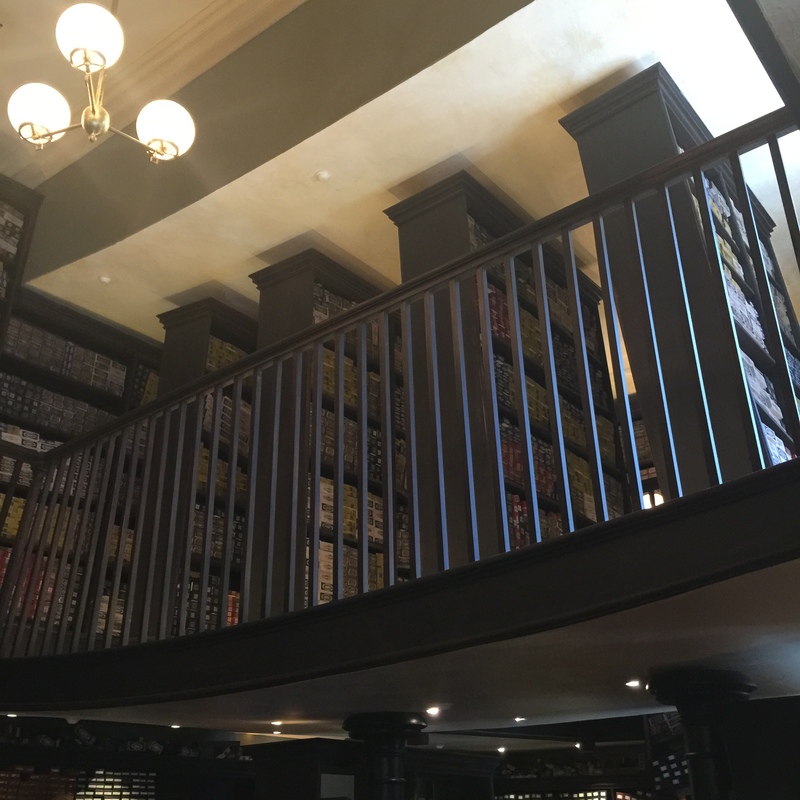 Read the Intro to the Wizarding World series. Learn all about making Butterbeer. The only hard part of the demo is that the wait is so long and then only one person gets to do it. Thanks for reading!! So excited you went! I think I get to go in December! Definitely loved seeing this, thanks for sharing!! I have no idea about anything Harry Potter, but they were getting ready to open this when we visited Universal (California) in July. My little sister would be into it. She wrote to me excitedly to tell me about a Harry Potter-themed bar that had just opened near me and was blowing up on Buzzfeed. I hope to visit there someday. It sounds like fun! It is!! Thanks for the read! I loved your series on Hogwarts. The more I read, the more I’ve come off the fence about wanting to go an visit both Hogwarts and Diagon Alley myself. I would love to do a reblog of your this series on my blog. I think my reader would love your writing as well. Thanks. I am more that willing to link back to your site and will most definitely credit you . And I’m glad there is another post on Friday. I’ll mention that as well.